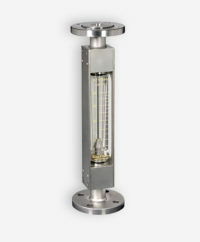 Kytola Model KLFH flow meters are designed for industrial use and feature a protected flow tube and DN or ANSI flange connections. Model KLFH variable area flow meters are suitable for liquid or gas, and are typically used in lubrication oil measurements, flush water applications and vacuum pumps. Optional features include scales for alternative liquids or gases and a low/high flow alarm if required. Our team are happy to help you determine the best construction for your application, just get in touch.